I can’t resist this one this morning. Let me tell you about a teacher of mine. When I was in Hebrew School, our Junior Congregation leader was a man named Harry Kraft z”L. Mr. Kraft was a tall, imposing man (although I suppose everyone looks tall at that age). He stood above us pointing out the words on the page with a gentle firmness which I can still remember as if it was yesterday. He taught us melodies that I still know and still use. I never knew my grandfathers and Mr. Kraft was as close as I came to that at that age. He was so patient with all of us but could get us all singing with spirit and with meaning. I have never forgotten his songs, his manner and his presence. And when his son, Robert Kraft, accepted the AFC championship trophy yesterday and pointed up to the heavens to remember his dear wife, Myra, who died last year, I thought of her legacy of philanthropy and dedication and I thought, immediately of Mr. Kraft’s love of teaching and learning. I’m glad my Patriots are back in the Super Bowl for a lot of reasons that you probably can figure out- but one additional reason is that it gives me a chance to remember Harry Kraft Z’L and thank him again for all he taught me. So, in the previous two postings, I told most of the story. Of course, we should have looked at the Yad Vashem Archives of Holocaust victims. We would have found Shael’s name there had we known he had moved to Preili. We would have found Haim’s name there (he apparently moved back to Daugavpils) but we didn’t know his name. So, we might not have located the information. But, now with more specific names and places, we found the family members listed on the Yad Vashem site. One of those records belongs to my second cousin, Sora, with her married name. But her entry in the database was different from many others because it included the “testimony statement” submitted to document her death. It was filled out in Hebrew by a man who said he was a “ben-ir”, a person from the same town. It documented the date of her death and was signed and dated April 18, 2010 (that would have been my father’s 89th birthday). The form listed the name and address of the man in Israel. I went to the Internet and found that Israel telephone information had a record of a man by that name living in his city but at a different address. Still, there was a phone number and after a few days of hesitation, I decided to call. I hoped for an answering machine. I didn’t trust my Hebrew in an emotional conversation but a man answered and I asked: “Was he the one who submitted the form for Sora?’ He said, yes, he lived in Preili and knew her. He asked me why I wanted to know. I said, using the Russian pronunciation, that my name was Dobrusin. He said; That was her name before she was married. I told him that her father was my grandfather’s brother. I asked him if knew him and he said words I will never forget. He said; “Shael Dobrusin was the Gabbai (the assistant to the Rabbi) in the old synagogue in Preili”. I literally felt my knees shaking. It wasn’t so much that he said he was the Gabbai. It was that he said his name. Here was a man in Israel telling me he knew my great uncle and called him by his name. I was stunned, at the same time so happy that his name was known, so sad at all that we had learned. And the mystery continues… my grandfather had listed his place of birth on his naturalization papers as Sumach, Russia. We can’t find any record of that place but the Latvian records said that my great grandfather was born in a place called Shumyachi quite a distance away from Latvia, near the Ukraine. One website I consulted says that one of the alternate spellings for Shumyachi is Sumcahi. Could this be what Julius was referring to? If so, it is not clear why he would have misrepresented his birthplace (the records say he was born in D’vinsk) but that made me wonder. So, I went back to the records of Yad Vashem and saw that there are many Dobrusins listed as having been killed in the holocaust, many from Shumyachi. There are many Dobrusins in this country that I have met or been in contact with over email and none are related to us closely. Most of them claim they are from the Ukraine. And so, I wonder, and will continue to investigate, if they came from near Shumyachi, they might be family members Itzik left behind when he came to D’vinsk. More distant cousins. More of the family. This has been a fascinating 2 weeks as we have been piecing together material about my father’s family (and my mother’s as well, see previous posting). It was fortuitous that I was given the name of the woman in Latvia to help. But, I have to clearly say that my cousins (both 1st and 2nd) and my uncle and my father had laid the foundation for all of this information. They worked tirelessly on this investigation for years. I’m glad we are able to come up with some answers. The picture of my grandfather’s family was sent to me by another one of my 2nd cousins. We had never seen this picture as my grandfather didn’t keep any family photos. My cousin had, like my father and my uncles, undertaken some serious work to find more information about the family. She knew the names of the other children. That’s Rebecca, the youngest on the far left and Shael, the oldest sitting next to his wife and holding their children. Their names were not known to us and neither was their fate. Julius, my grandfather, had traveled to Latvia in 1931 on a trip that he took to Europe and Palestine. My father remembered that Julius met his brother Shael and his family and we also had heard that Rebecca had died although the circumstances of her death were a matter of question. But, all other genealogical research seemed to reach a dead end. Specific details were known in some cases but there was so much that we didn’t know and couldn’t find out. Just as the discovery of my second cousins started with a coincidence (if you believe in coincidences…) as my friend found her husband’s picture, this part of the story also starts with a chance discovery. Every few months, I would do an internet search on Daugavpils Jewish community sometimes throwing in the name Dobrusin to see if we could get more details of life in that town. This time, though, I saw a story about the rebuilding of a synagogue in Daugavpils and the story mentioned a name I knew well. One of the people involved in that project was a friend who used to live in Ann Arbor whose father was born in Daugavpils. I called him and we talked for a while about what he knew about the city and then I told him of our genealogical quest. He gave me the name and email of a researcher that he had been working with in the Latvian state archives. He told me she might be able to help. Sure enough, she responded with a willingness to search the archives and for a small fee (try wiring money from Michigan to Latvia- it’s not so easy), the search began. A few weeks later, I received an email from her asking me if I knew the name Schewel Dobrusin who was living in the area in the 30s. I assumed Shael and Schewel were the same person and she told me that she had some information for us which would be coming in the mail. On a Shabbat morning, when I was on vacation and happened to be home, the mailman rang the bell and told me he had a registered letter for me from Latvia. I took the envelope and took several deep breaths, holding onto it, knowing that it was possible that it contained answers to questions which had plagued our family for decades. I thought about my father and my uncle and how they might have reacted to what was inside. I opened it and our family history was all there. 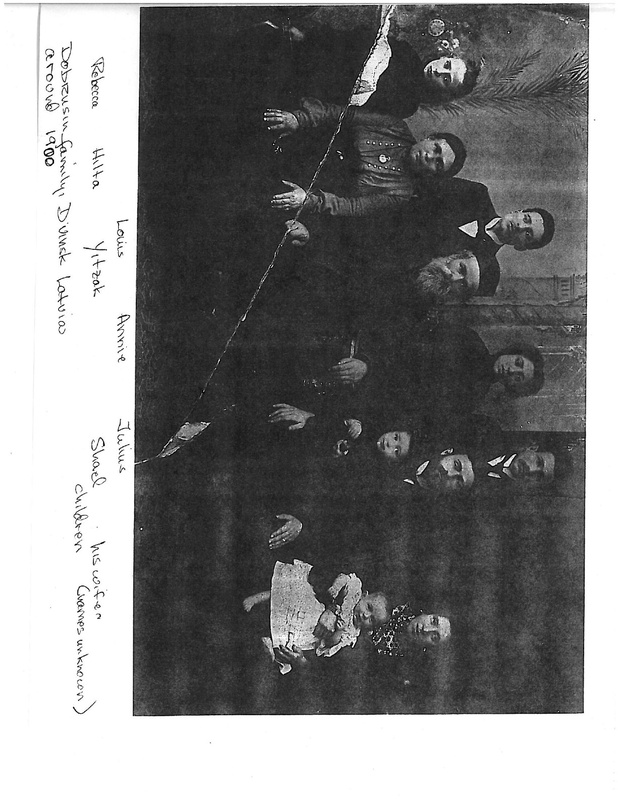 My great grandparents Itzik and Hilta, their five children, Schewel (Shael), Jewel (Julius), Laizer(Louie), Hannah (Annie) and Rivka (Rebecca). Birthdates, address in Daugavpils, occupation- all of it was there. What was most important was that the records indicated that Shael and his family had moved to another town, Preili, with his wife, Luba and their three children Haim, Sora and Moisey. The little boy in the picture on his father’s knee is Haim, my father’s first cousin. My father’s name was also Haim and presumably they were both named for Hilta’s father whose name is recorded in the archival material. The little baby is Sora. Moisey was not born yet and, sadly, there is no more information about him. But, Haim grew up to marry Maria and they had a child Joseph, my second cousin. Sora, grew to marry a man name Avram Ya’akov and they had a daughter Luba, named I assume for her grandmother, Shael’s wife who had died in the early 30s. Then, the piece to the story which was inevitable. Schewel, his children and his grandchildren all were killed in mass exterminations by the Nazis in Preili in the summer of 1941. That statement I had always made: “We don’t have any close family we know of who died in the Holocaust” is now obviously untrue. Truth is, we knew all along that it was likely that any family members who survived to the late 30s probably did not survive the Holocaust but without names, without proof, it was not real. Now it is. And now, while Yom Hashoa, Holocaust Memorial Day, was always a sad day, now it is sad in a personal sense. I do not know how I will feel. But, I will light yahrzeit candles not for the Holocaust victims as a whole but for Shael, Haim, Maria, Joseph, Sora, Avram Ya’akov, Luba and for her two younger siblings whose names are not known as they were born after the census of 1935 but who are recorded as having been killed on that horrible day in 1941 in Preili. I had plans to go to Israel on a study program this summer. Those plans, I think, have been put on hold. I want to go to Daugavpils and Preili. There are no Dobrusins to meet and one would assume no evidence of their having lived there. But, I want to stand where they stood, mourn their loss and let them and everyone know they are not forgotten. There is one more piece to the story which I’ll save for part 3. This is a picture of my great grandparents, their children and grandchildren taken in D’vinsk, now Daugavpils, Latvia around the year 1900. My grandfather Julius is in the back row on the right. He stands next to his sister Annie and his brother Louis. These three siblings came to America. The others remained. Before I tell any more of this story, I must remember and say a prayer of thanks: had they not come to this country, there would be no one to tell the tale. My grandfather was a carpenter who became a building contractor. He was a hard working and extremely intelligent man. He was thoroughly steeped in the Jewish tradition but clearly was a “rebel” in the finest sense of the word. He rejected religious tradition, held onto his identity as a Jew, studied Yiddish, was active in the Arbiter Ring, the “Workmen’s Circle” and when we would ask my father what his father would have said if he knew that two of his grandsons were Rabbis, my father would say; “He would have argued with you like crazy and would have loved it”. My grandfather Julius died when my father was a teenager. He never knew his grandchildren. The stories we hear of Julius are, quite frankly, not the most positive. Julius had a temper, did not have a very loving relationship to say the least with my grandmother and somewhere along the line was directly or indirectly responsible for a rift in the family. We never knew his sister Annie’s family. We only knew her name. A few years ago, I heard from an old friend from college. We hadn’t been in contact in years and I was surprised to suddenly hear her name. She called with an interesting story. She was looking through her husband’s old family photos when she came upon one which had a name on the back. It was a picture of a young woman and written on the back: Annie Dobrusin. She asked her husband and he said that he understood that that was his grandmother’s maiden name. She knew that Annie was from Boston and so she called to ask if she was related to me. I told her what I knew to be her married name and she confirmed. This Annie, her husband’s grandmother, was in fact my grandfather Julius’ sister. Her husband and I were second cousins. That began a long and wonderful story of a group of 1st and 2nd cousins meeting over email, telling family stories, trying to unravel family legend. And, on an unforgettable Jerusalem evening in June, 2007, I walked into the Little Italy Restaurant on Keren Hayesod Street in Jerusalem with my son Avi to meet one of my 2nd cousins in person for the first time. She recognized us the minute we walked in the room: “I would know a Dobrusin anywhere” and we sat and talked and laughed and theorized about the rift that had kept us all apart. Two years later, I was back in Israel and this time my visit coincided with the visit of two other 2nd cousins including the one whose picture started it all. We have a beautiful picture of the four of us which hangs in my office. In Jerusalem, two generations later, the descendants of Julius and Annie sat and smiled and hugged, something the grandparents could never have imagined. It’s a wonderful story but it is only the beginning. Pirke Avot tells us to know from where we came and while the intended meaning of the text was likely more spiritual in nature, I find great meaning in this statement in a different direction. To whatever extent we can, we are obligated to know our own personal history through familiarity with our family lineage and the stories that go along with it. This past week has been an extraordinary week for me and my family as we have discovered over the past week some very significant information concerning both sides of our family. The story of the discovery in our father’s family is long, detailed and dramatic and I will cover it in future postings as I am still trying to put all the pieces together. But in this posting, let me tell the story a new discovery we have made in my mother’s family which is extraordinarily significant to me. My mother used to tell my brother and me that we should be proud that we are 5th generation Americans on one side of the family (her father’s father’s family). But, we were never able to confirm that because she had no idea which of her great grandparents had, in fact, lived here. She only knew that he or she was buried somewhere near Worcester, MA. But, she would tell us the story with pride. In 2002, my mother left Boston for what turned out to be the last time and came to live near us in Ann Arbor. On the last day we were in Boston, my brother and I went to all the cemeteries to visit the graves of her parents and grandparents in various cemeteries around Massachusetts and New Hampshire. While we were standing at the graves of my great grandparents, Morris and Annie, she told us again about the mystery ancestor buried near Worcester. Last Sunday, after all the information about my father’s family became clear, my son went to a Jewish genealogical website to see if he could find any other details of the new information we had received. He didn’t find any other information on the Dobrusins but sure enough, he found someone who was trying to find out what several family names, including Dobrusin, was doing in the records of her family’s “association” of the 1950’s. I knew exactly what they were doing there because all of the names were names of my grandfather’s married sisters or daughters and since he had 10 siblings, there were quite a few. I also knew the name of her husband’s family because I had heard that name many times when I was young but I didn’t know how the families were related. It took a bit of investigation and some back and forth emails but we finally figured it out when we realized that the one fact which we had known but others hadn’t was that my great grandfather Morris had changed his last name. At that point, we all realized that the connection of the families was that Morris’s sister had married into the other family. So, now it was clear that the husband of the woman who had contacted the website was in fact, my 3rd cousin. That’s nice to know. But, what was more important to me was the fact that she told me that in fact, Morris and his sister Jenny’s mother, Rasha, was buried in a cemetery outside of Worcester, MA. Rasha was my great-great grandmother and that was the person my mother had always told us about without knowing the details. On my next trip to Boston, I plan to visit my great great grandmother’s grave and for a 56 year old American Jew of East European descent, that is certainly unusual. And, for my brother, who is a grandfather, to bring his granddaughter to the grave of her great-great-great-great grandmother would be truly astounding. So, that’s the story. A changed name, a distant cousin and a family gravesite. All of this has helped me to understand more about where I came from and the next part of the story, concerning my father’s family is still to come.